Richard Theodore “Ted” Adams was destined to become an actor as he was literally born in a theatre dressing room in New York City, March 17, 1890. His parents were vaudeville performers there at the time. Adams gave up the stage at 18 to enter Cornell University but, after graduation, returned to the theatre where he spent three seasons in stock before going to New York City. For more than half his life he performed on the stage before coming to films in his mid 30s. There was a brief time out for service in the Navy during WWI. Adams was a good friend of Leo Carrillo, both appearing in Porter Emerson Brown’s play “The Bad Man” in 1920. Adams did an occasional revival of the play. He also performed in the hit Broadway production of “Kongo” which starred Walter Huston in 1926. His earliest documented role is as the family doctor in Al Hoxie’s “Road Agent” for Rayart in 1926. 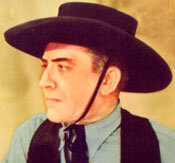 Adams made his sound film debut in Bob Custer’s “Under Texas Skies” in 1930. 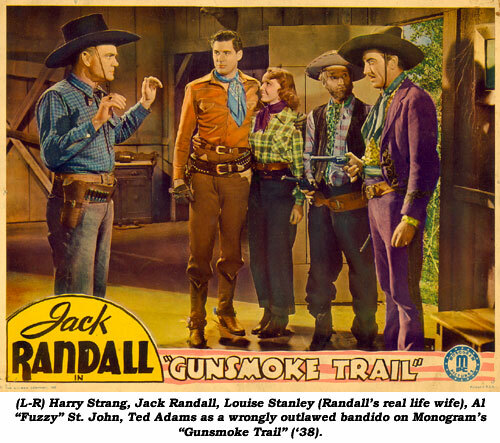 With a strong voice and a solid screen presence Ted quickly established himself in westerns in which he worked almost exclusively for a quarter century in over 200 films. 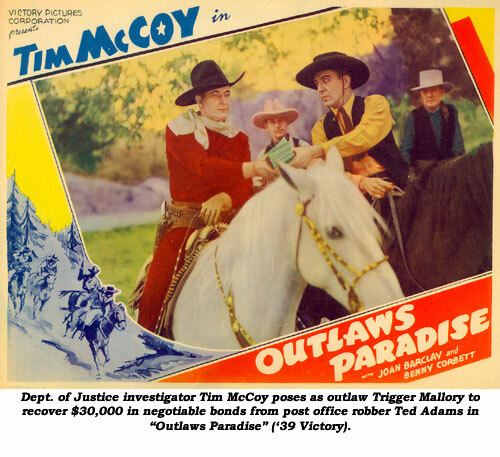 In his first few films he was cast as a good guy, and to truly appreciate his acting abilities one needs to watch “Rider of the Plains” (‘31 Syndicate) in which Ted plays a reformed owlhoot, now a Parson, in love with the same girl hero Tom Tyler favors. 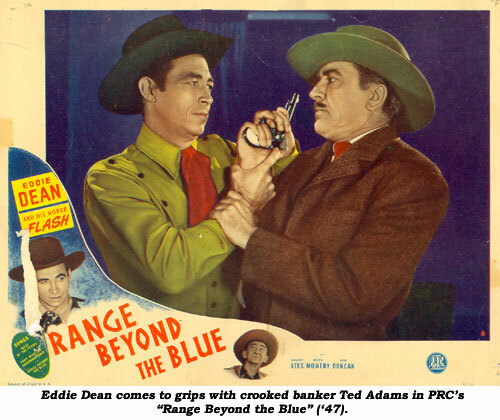 Adams found his badman niche by ‘32 and worked steadily for, mostly, the low budget independent outfits such as Puritan, PRC, Supreme, Victory, Metropolitan, Colony and Grand National, only seldom venturing over to Republic, Columbia, Paramount and Universal. Serials didn’t escape Adams either. Making 12 cliffhangers, his best roles came in “Holt of the Secret Service” (‘41 Columbia), “Daredevils of the West” (‘43 Republic) and “King of the Rocketmen” (‘49 Republic). 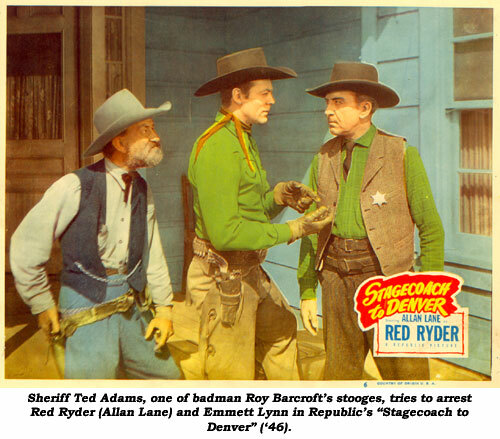 Circa 1942, now 52, Adams didn’t totally give up badman roles, but he began to undertake more sheriff and rancher parts. Even at an advanced age, Adams spent time in the Navy during WWII (1944-‘45). He honed in on Monogram in the late ‘40s and was a staple in Johnny Mack Brown, Jimmy Wakely and Whip Wilson B’s. 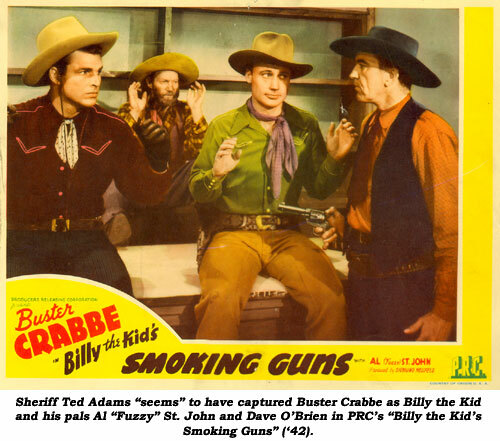 Parts becoming smaller, the B-westerns he enjoyed so much coming to an end, at 62, after a role in Bill Elliott’s “Kansas Territory” (‘52 Monogram) and some TV work on Russell Hayden’s “Cowboy G-Men”, Ted Adams hung up his spurs. 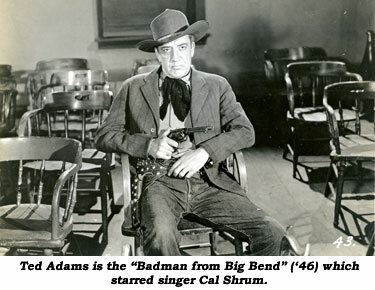 During the ‘40s, Adams teamed up with another badman, Jack Ingram, to go on tours of small theaters around the country. Adams lived quietly in retirement until his death from heart disease at 83. Widowed at the time of his death, September 24, 1973, he was at Braewood Convalescence Hospital in South Pasadena, his place of residence prior to his death. His cremated remains were placed at Chapel of the Pines Cemetery in Los Angeles.